DENVER, CO - (@The Comedy News) - Following quarterback Peyton Manning's announcement that he will be joining the Denver Broncos, Tim Tebow held a press conference under the direction of his lord, savior, and agent, Jesus Christ. The first question for Christ questioned his judgement, or lack there of as the reporter alluded: "Hi, Tom White, SI (Sports Illustrated), can you explain the decision to deliver Tim to the Broncos only to have him benched three years later for Peyton?" The Holy Redeemer paused and bit the left side of his lip before deflecting the question: "Look guys, this wasn't my decision to bring in Peyton, it was my father's," said Christ. "I can't really explain it myself, he works in mysterious ways." 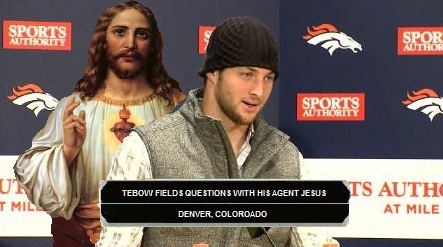 Christ appeared to not allow Tebow to speak on his own behalf for the duration of the 8-minute press conference. However, when Christ indicated that the sermon/press conference was over, Tebow began to kneel on one knee with his head bowed in prayer. Christ then rolled his eyes and quietly commanded, "come on, kid, let's go" as he nudged his client off the podium. In a related story, New England Patriots quarterback, Tom Brady, weighed in on the Peyton-Tebow situation in Denver through his agent, The Devil: "These Manning brothers are snoozeville. Wake me up when they get three rings."